Among the highlights in today's program is the opening panel on the Global Rise of Citizen Media led by Global Voices co-founder Ethan Zuckerman. Later on, we'll be taking a closer look at social media and the Arab uprisings, the tactics employed by citizen media activists in “small” African countries to get their plight heard by the world, and ideas for how to keep endangered languages alive online. Giants of the Internet will be a session that explores the role of global internet corporations and how citizens can hold them responsible. Google's Director of Corporate and Policy Communication, Bob Boorstin will be participating in this session. Finally, we will be announcing the winners of the Breaking Borders Award. 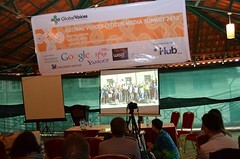 Two cash prizes of $10,000 will be awarded to projects from the extended Global Voices Community. Tomorrow's program will look at privacy and free speech, internet governance, online advocacy for health initiatives including HIV/Aids, and data visualization strategies. Throughout both days of the program we will also be hosting audience led sessions and workshops (unconference-style) where participants can raise further topics.